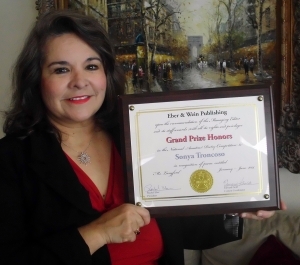 We are proud to announce Sonya Troncoso of San Antonio, TX, is the grand prize winner of the January–June 2014 poetry contest! The judges loved her poem, “Ms. Langford,” for its offbeat narrative and witty details. 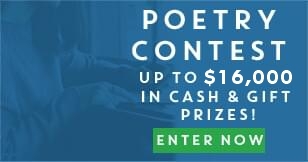 This was not the first contest Troncoso has entered, but it was her first time submitting to Eber & Wein Publishing, and it has been “a wonderful experience.” She entered not for the cash prize but for affirmation of her poem’s merit and the opportunity to be published. Warm congratulations also go to the twenty second place and one hundred third place winners. There was a robust turnout; judges read through about 15,000 semi-finalist entries. The list of winners is available online at www.eberandwein.com. Troncoso currently serves as an assistant principal for the San Antonio Independent School District after twenty-five years as a teacher. She holds a bachelor’s degree in early childhood education and a master’s degree in educational leadership. She is currently working on a novel and also hopes to publish a book of poetry—she is very dedicated to her writing and poetry. Her earliest memory of writing is composing a short rhyming poem at six years old; she has always been captivated by poetry. She says her father, who was clever with words, was a major influence in her life. She began writing more regularly, for the sheer joy of it, after receiving a locking diary in fifth grade. Troncoso’s ninth grade English teacher, Ms. Langford, had a big impact on her—she was the first one to say to Troncoso, “You are a writer.” Ms. Langford’s assurance gave our winner the confidence to continue writing. Ms. Langford talked about authors and poets with such reverence that Troncoso thought they were personal friends of hers. Today, Troncoso’s favorite poets include Shakespeare, whose prolific work is timeless, Sor Juana Inés de la Cruz, Pablo Neruda for his passionately romantic sonnets, as well American poets Robert Frost and Maya Angelou. “Words are important,” Troncoso says, “and can shape, persuade, motivate, destroy, inspire and elevate the human soul.” The power of words and the process of arranging them in meaningful ways is what Troncoso truly enjoys. This entry was posted on Wednesday, October 1st, 2014 at 12:00 am. Both comments and pings are currently closed.